Designed by Virginia Lauth. 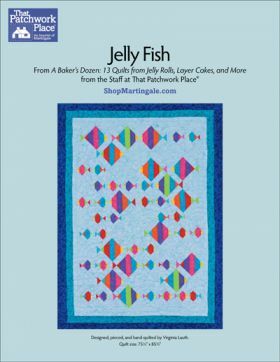 A visit to the aquarium was the inspiration for this delightful "Jelly Fish" quilt, made from-what else?-a Jelly Roll! 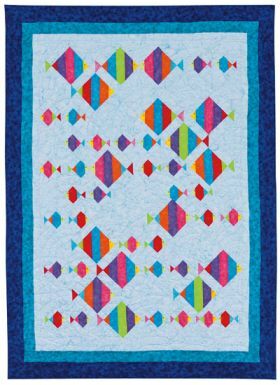 Create a school of big and little strip-set fishies with a color-splashed Jelly Roll, or cut bright strips from your stash. Finished quilt: 59 ¾" x 82 ½"
Virginia has worked in the accounting department at Martingale & Company for 16 years. She learned basic sewing, knitting, and quilting skills from her mother at an early age and has been an avid quilter for most of her life. Virginia and her husband, Marty, reside in Shoreline, Washington, where they have raised three wonderful children: Rudy, Daniel, and Laura. In recent years, their family has grown with the addition of daughter-in-law Alicia and grandson Marcus. Quilting for her growing family continues to provide inspiration and joy. Virginia looks forward to designing many more unique and colorful quilts.